This afternoon I went for a new ride at Waharau Regional Park. Kerry has just realised that he won’t be able to come to Taupo with me next week because his son Ben’s wife is about to produce his third grandchild. Felicity and Judith are off to Europe for three weeks, and I’m planning to ride as many cycleways as I can while they’re away. So Kerry was keen to go on a big mission today; preferably somewhere new. I have tramped this particular route with Felicity and my two boys, many years ago. The park is one of my favourite camping spots. The track started on a 4WD road, which narrowed as it climbed into the bush. Soon it became far to steep to ride up, so we spent most of the next hour pushing. 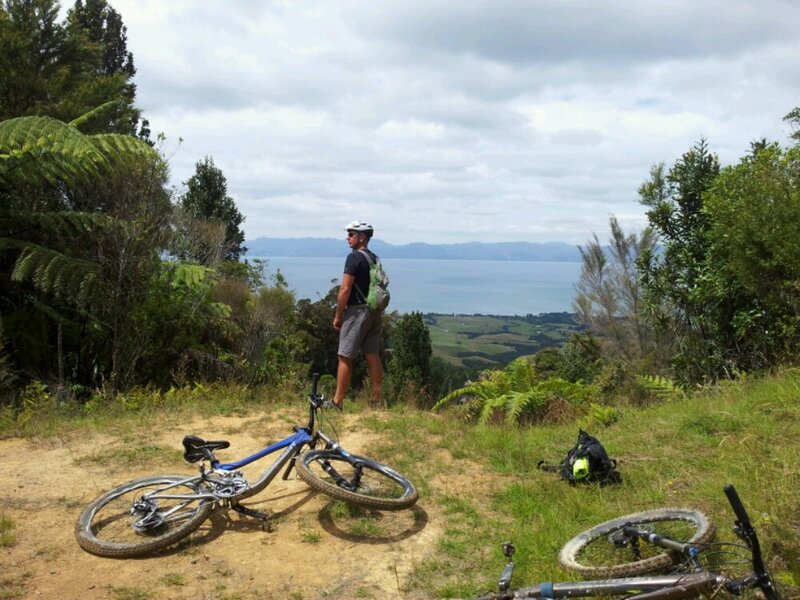 A lookout provided a welcome place to sit and admire the view of Coromandel across the Firth of Thames. We continued dragging our bikes upward. I commented that the “bike trail” must have been designated by a bureaucrat in an office who had never ridden a bike. But eventually we reached the ridge, and we were finally on a very fine trail where we could enjoy riding. We stopped for a snack at Workman’s Camp, just before the bike trail leaves the ridge and descends back to the highway at sea level. We turned back at this point, knowing that the downhill section of the loop back in the park would be more fun to ride. 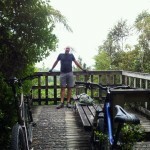 The steep single-track through the kauri was significantly more fun to ride down than it had been to slog up. I was just able to maintain control of my bike – I was sure glad the surface was dry! When we turned off onto the return loop the trail opened up and our speed increased. All our earlier efforts getting to the top of the hill were rewarded handsomely. We called in at Takapakanga Regional Park for a swim at the beach on the way home, and discovered a 6km bike trail there as well. Looks like we’ll be back before too long! 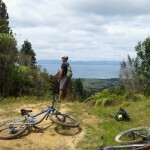 This is the best downhill I have ridden close to Auckland. It needed alot of persuasion on my part to convince John that we should do this ride.